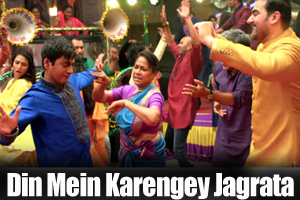 A Dance song sung by Divya Kumar, Wajid Khan and Swati Sharrma featuring Arbaaz Khan, Nawazuddin Siddiqui, Seema Biswas and Asif Basra. The video of this song is available on YouTube at the official channel T-Series. This video is of 1 minutes 46 seconds duration. Lyrics of "Din Mein Karengey Jagrata"
Lyrics in Hindi (Unicode) of "दिन में करेंगे जगराता"